Kirrawee is one of the Shire suburbs that straddles the rail line. And its thanks to its proximity to this rail line that the suburb offers easy access to the newly opened shopping precinct, South Village. Shire residents love to eat well and they love to eat out. Here are a few places to eat and drink dotted around Kirrawee. The bacon and egg roll at Howling Forest café is hugely popular with tradies who love the fact the deluxe version includes a hash brown slathered in hollandaise sauce. The high-vis vest brigade are also partial to a Hair of the Dog Brekky Burrito. Chef Anthony is a vegetarian so expect ongoing experiments with innovative dishes that celebrate vegies in the height of the season. Our pick: the vegie breakfast bowl with black sesame and avocado, pine nut, rocket and feta. The Howling Forest Café, named after the trees that have a temper in the nearby Royal National Park, is set to open an additional outpost in Kareela. The café uses White Horse coffee so expect a decent brew, too. 165 Oak Rd, Kirrawee. Moim, which is located in the heart of Kirrawee on the edge of the suburb's high street, is a deserved local favourite. Lounging around here al fresco is a local pastime and a very pleasurable endeavour: start with the wonderfully warm and salty miso soup which contrasts beautifully with the soft pillows of bean curd and the agedashi tofu which arrives with curls of seaweed and spring onions and is a textural delight. The salmon bento box is also packed with flavour and made to share with elegant portions of fresh sashimi, sushi and crunchy tempura vegetables. A whammy of wasabi ups the wow factor. 34 Oak Road North, Kirrawee. Thoroughbread Bakery is the little bakery that could. 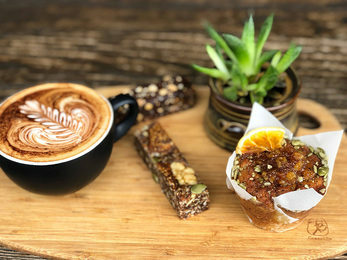 What started out as a passion by self-taught baker Nick Tabet is now an obsession and those that appreciate the bread's superb flavour will be thrilled to hear the bakery in the industrial estate of Kirrawee now has a retail outlet out front. Nick's bread is the antitheses of mass-produced soft, doughy supermarket bread: his loaves have a crunchy robust crust and a slightly elastic feel. His sourdough also makes the best toast ever, is brilliant for bruschetta and produces fantastic breadcrumbs. Buy a loaf of the naturally fermented sourdough bread and smear it in Pepe Saya butter. Grateful bread heads will also appreciate nearby Bourke St Bakery, Baked Patisserie and Black Olive Gourmet Food. The big-hearted menu of meat and smallgoods at this family butcher run by Stefan Birmili (Rudi’s son) includes lots of surprises. Venture inside Rudi's for Foodies, which opened in 1983, to find handcrafted artisan-German-style sausages, wurstwaren and charcuterie as well as grass-fed lamb and beef and born-and-bred free-range Bundawarrah Pork. As well as stocking specialty meats, the Kirrawee store stocks a range of imported mustards and pickles and artisan Australian cheeses. 148 Oak Rd, Kirrawee, 9521 1414.